Explore Africa Adventures is one of the highly experienced Tour Operators entrusted by The Adventure Motoring Magazine, LEISURE WHEELS, as well as the Travel Magazine, GETAWAY, to do a selected range of safaris for them. The operations is wholly owned by Martin Slabbert, and is also the guide responsible for all the African self-drive safaris outside of South Africa. After a long career in the corporate world, Martin decided to follow his dream. 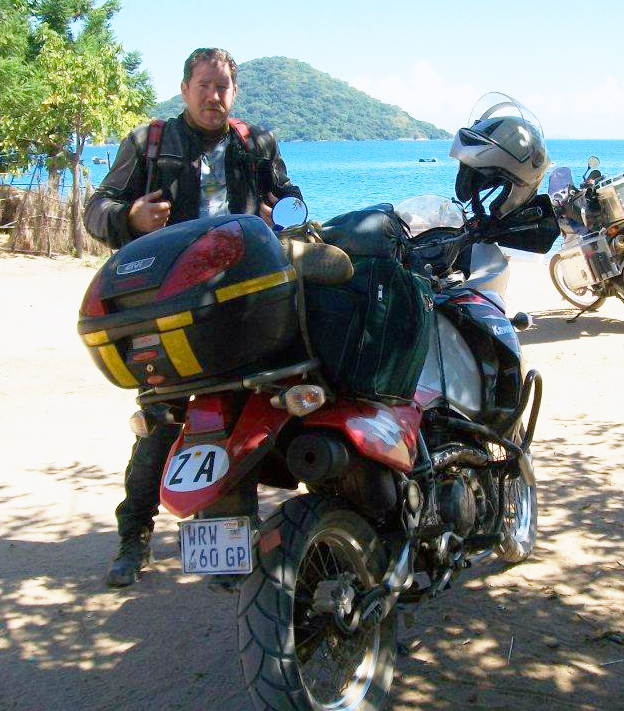 With extensive adventure travel experience in Southern Africa through countries like Namibia, Botswana, Malawi, Zimbabwe and Zambia, he changed from mainly 2-wheel-travel to 4 wheels. Martin is married to Magda and they have two sons, Pieter and Christo. - B. Comm degree in Marketing. - Teta (TETA 09-201) 4X4 off road vehicle qualification. Martin Slabbert from Explore Africa, the preferred tour operator for Leisure Wheels, ventures through Zimbabwe, Zambia, Malawi, Tanzania and Botswana every year in July and August to the Serengeti and back. The whole trip is 39 days. Last year I joined the group from Mussina to Malawi (see LW (Letters) Dec 2017). This year I decided to join them in Tanzania after their Serengeti experience. Next year I will do the middle part from Malawi to Tanzania. What follows are my experiences and should not be judged. The wife of a tour operator mows the lawn, takes out the garbage, feed the dogs, do some maintenance and pays the bills, so when she is spoiled; I promise you, she deserves it. I boarded Air Kenya at one o’clock in the morning – a bizarre time to fly! I never slept the night before nor the day of travelling and I had a terrible cold. On top of this I was anxious to see Martin after 29 days and I feared travelling alone to Africa! I flew directly to Nairobi where I had to stand over for two hours and then take a local flight via Kilimanjaro (Arusha) to Mwanza in Tanzania. The airport in Mwanza is nothing more than one small building, it does not look like an airport at all. On arrival I had to be checked medically, fortunately I remembered to have a yellow fever injection and to bring my card along. The lady took my temperature which was 34 degrees. She was completely confused, what should be done, I am too cold as 37 is the average, what is wrong with me? It took me nearly 30 minutes to explain that I am fine, just tired. In the meantime, the luggage from Nairobi was delivered, guess what, without my bag! After convincing the lady behind the glass that I am fine with my 34 degrees temperature I absolutely lost it when I found out my bag was missing. I did not just sniff, I went for an Oscar performance, I cried! No one knew what was wrong with this white lady sobbing as if it is the end of the world. A huge man approached me, put his arm around my shoulders and softly said I should calm down, he will help me, I have nothing to worry about. I just cried!!! He filled in all the necessary forms while I kept on crying like a baby. He even walked me out to the driver of the hotel who picked me up at the airport. He promised me he will find my bag and will then notify the hotel. I just cried! I wept the whole way to the hotel. At the reception of the Ryan’s Bay Hotel the beautiful lady at reception also tried to console me, but I just kept on crying. Before I came to Tanzania, I notified the hotel that I would be joining the Explore Africa group. Martin and one of the single guests who went alone on the trip were going to share a room to save costs. With me joining, we needed another single room. I arranged to pay on arrival. My maths have never been good, especially when the exchange rate is applicable. I did not bring enough cash, I took out my credit card and between the sobs said to the lady she can take everything I have, I do not care anymore. She was so kind and tried to calm me down saying that I would love Mwanza. I was taken to our room and then cried even more with embarrassment. They gave Martin and me something like a penthouse. We had a kitchen, a dining room, a sitting room a huge sleeping room and a jacuzzi! All this for the price of a single room. Wow! Martin and the group arrived eventually and I felt terrible. We asked (typically African) for forgiveness from the reception. The hotel was exceptional, it is on the banks of Lake Victoria. Lake Victoria is Africa’s largest lake by area, the world’s largest tropical lake and the second largest fresh water lake in the world and the source of the river Nile. Mwanza is known for its large boulders but the place is typical Africa, there is chaos, different smells, a cacophony of sounds, a lot of friendliness and markets. I walked the streets up and down, bought some African stuff and chatted with the locals. I was never afraid and never treated as a foreigner, I was just another human being and I loved it. Back at the hotel I received the message that my bag was found and I could pick it up at the airport. On arrival at the airport the huge friendly man came running to me shouting: “Magdalena (my ID name!) I found your bag!” he hugged me and asked whether I am okay now. He handed me my bag asking whether there is anything to declare in it. I said no, thanked him profusely, took a photo of the two of us and left. If he only knew what was in the bag…. there was only a duvet, a bottle of wine and my swimsuit! On a previous trip with Martin we only had a single bed duvet between us in the roof tent. After 32 years of marriage it is not romantic anymore to sleep nearly on top of each other to fit under one duvet, so I decided to bring my own! My clothes were in my hand luggage. In the duvet was an expensive bottle of wine for a very special occasion. The swimsuit was an afterthought. After two full days in Mwanza I was sad to leave, I fell in love with the place and would want to go back again. En route to a campsite next to Lake Tanganyika in Kigoma we slept in a former colonial hotel built in 1924 by German settlers in Tabora. Next day we went off to Lake Tanganyika: the longest (677km) fresh water lake in the world, the second deepest and the second largest by water volume. The following day was scheduled to track some chimpanzees in the Gombe National Park. A boat (imagine a “vissersskuit by Paternoster” with a roof) came at six in the morning to take us to the park to find the chimpanzees of Jane Goodall. Fortunately, I had a good night’s sleep under my own duvet! The trip took three hours but it was beautiful. You see the sun rises and gets an idea of the vastness of the lake. At Gombe you must pay the entrance fee with a credit card and remember your passport! We climbed for hours before we found the chimps. Please take note of the tour leaders advice to wear proper hiking shoes, fancy tekkies from a boutique does not work - I‘ve learned that he hard way! It takes hours and lots of climbing before you finally sit amongst the animals. Sitting there close to primates with nearly the same DNA as a human was amazing. You are not allowed to make eye contact but if you sit calmly the chimps ignore you. The young ones gave us a display of their energy – you must be quick with the camera. The downward path is even worse; one lady in the group just sat down and bumped all the way to safeness down under. It was an exhausting day but the experience could be ticked off the bucket list. The boat trip back was four hours and the lake was angry with the wind, it is as if you are in a storm out at sea with huge waves, the only difference being that it is fresh water. The next stop was Katavi National Park. Typically a national park in Tanzania, the ablution facilities were awful. Enough said, so the next day we drove to Kipili, a small town on the edge of Lake Tanganyika. Martin told me once about the place but I had a sort of a tent camp in mind only to find that the Lake Shore Lodge is paradise. If I could have my honeymoon all over again I will choose this place. The owners are Chris and Louise, a young South African couple who moved to Tanzania in 1997. They opened the Lodge in 2009. All the furniture, windows and doors have been made by hand with local wood with a reddish colour and then oiled with palm oil. The style of the place is African-Zen as they have tried to incorporate all the elements of light, water and the earth. I decided on the spur of the moment that the two duvets could stay in the roof tent as I will upgrade us to a chalet or a Banda as they call it. It was worth every penny especially when we were upgraded to the honeymoon chalet the following day. Words cannot describe the luxury and the fun we had drinking South African Pinotage (not yet the one rolled in the duvet!) in the jacuzzi literally on the banks of the lake! I am glad I visited Tanzania and saw the place where the words “Dr Livingstone I presume” were uttered in 1871. We visited the spot in Ujiji, a Muslim village. This is ironical in a sense as Livingstone’s aim when he arrived in Africa was to bring Christianity to Africa and to end slavery. Henry Stanley, a journalist on a mission to find David Livingstone, finally caught up with him under a mango tree and said the well-known words. The original mango tree died in the 1920’s but two of its branches were used to plant the trees standing there today. The vastness of Lake Tanganyika is mind boggling and I found the people amazing, always saying karibu (you are welcome!). Tanzania is one of the least urbanised African countries, the urban population is only one-third of the total of more than 44 million people. The driving is difficult though, as you should drive only 50km/h in small villages and you may drive 80km/h when there are no huts or houses. But you end up driving 50km/h most of the time. This can be a bit frustrating. We crossed the border into Zambia at the Zombe border post. It was no more than a small office in Tanzania and an even smaller office in Zambia. No questions were asked and it took about 10 minutes. At our overnight stop in Mbala, I saw a chair carved out of a tree stump which was on the veranda of the reception area of our campsite. I asked to buy it, the manager said, what do I offer, I said $20, he said fine and the deal was done. I did not care where I will put it, I knew Martin would make a plan. He eventually forced it at the back of our vehicle next to the fridge, not very impressed with me!…..the beautiful chair is in my spare room reminding me of Zambia! In Zambia we visited Kapishya hot springs which are completely natural and sulphur free. The springs are situated close to the Estate of Shiwa Ng’andu (The Africa House) and along the banks of the Mansha River. The water just bubbles from the earth below and it is warm like a bath. We sat in the warm natural water for hours and drank the expensive bottle of wine, remember that one that was wrapped in the duvet in my lost-bag! The group then proceeded via Lusaka to Livingstone where the tour officially ended. The most difficult part for any tour leader is the saying of goodbye to people you shared 39 days with. I am glad I joined the group albeit for just more than 12 days. I saw Tanzania, Lake Victoria, Lake Tanganyika, Kipili and Kapishya hot springs. Places I would never have visited if I was not married to Martin. If asked, what does your husband do for a living, I answer: He makes his (and other peoples) dreams come true!